Enjoy a freshly cooked sandwich prepared with 100 cholesterol free and trans-fat free vegetable oil with two home cooked sides for $6.95 per person! Includes a cookie!! Now Catering for groups of 15 or more! We cater Parties 7 Days a week! That is right, your favorite restaurant in St. Matthews and Middletown also caters! 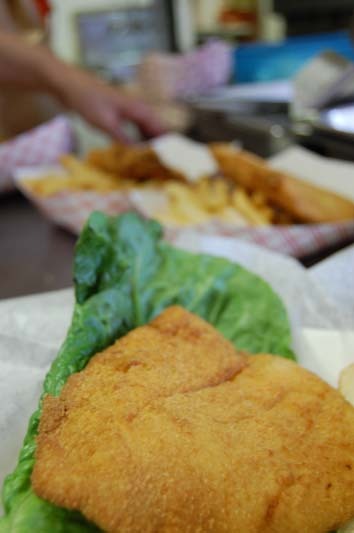 With over 500 thousand fish sandwiches catered in the past 10 years, The Fishery can take care of you. Parties of 15 or more, call us today with your catering needs! In addition to the best fish sandwich in town, try our homemade vegetable soup, bean soup, fresh cole slaw, hot macaroni & cheese, green beans, and/or seasoned rice. For only $.50 more you can substitute hand-breaded potato wedges, a garden salad or our famous homemade onion rings. Other popular entrees include chicken strips, fried gulf shrimp, fried chicken livers, salmon croquettes, frog legs and pan-fried oysters. For the lighter appetite, The Fishery offers baked fish and fried chicken salad. We can also provide iced tea and lemonade by the gallon.